Poundland are at it again: minimal effort, maximum PR/brand notoriety. Remember the ‘naughty elf’ campaign from Christmas 2017, mocking the Elf on the Shelf brand/idea? The ads – all tweets – were banned by the ASA, months after they first appeared, by which time the hype, interest, outrage, sharing had gained Poundland a shedload of publicity, and sales. Total cost of campaign: £25. This Christmas just gone – almost goading the ASA – they produced a reined-in version of the campaign, with the elves in slightly less compromising positions. Total cost of campaign: £76. 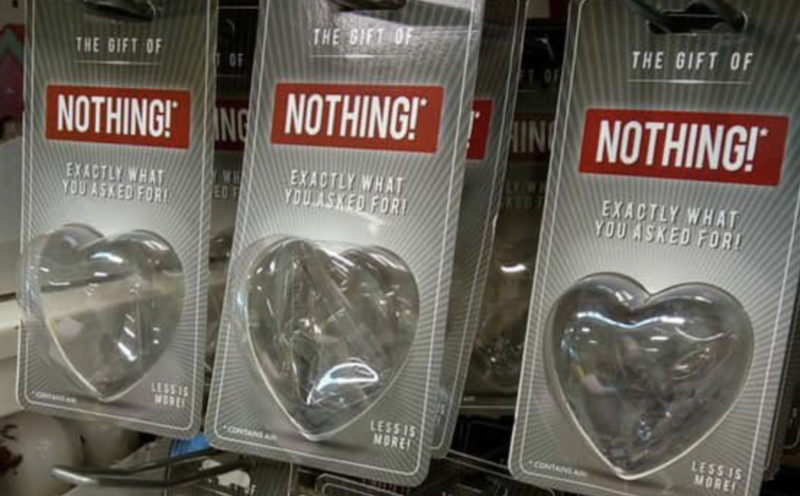 And now they’ve done it again, with a Valentine’s Day gift which consists of ‘nothing’, in the form of an empty, heart-shaped, plastic package – for those partners who said they wanted nothing on the day, when asked. Predictably, environmentalists, including Friends of the Earth, are outraged by this, stating that it’s a huge waste of plastic, will just end up in landfill (or the sea), and will take 500 years to decompose. They’re stating this across national media outlets, including radio, TV, and online news platforms such as the BBC, Sky, Independent. I don’t believe for a second that Poundland didn’t see this reaction coming. It is a huge waste of plastic, that’ll take hundreds of years to decompose, but it’s just given Poundland millions of pounds of advertising, across national platforms, for nothing. Zip. Nada. And if you consider the whole thing as a Venn diagram, on one side you’ll have environmentalists, who’ll never buy the product. On the other side you’ll have those whose partner wouldn’t find it funny. In the middle are those who would buy the product – a section that’s growing as the ‘nothing’ gift gets more media exposure. It’s win-win for Poundland, and – as they’re a bargain shop – no-one expects a highbrow, tasteful campaign or product from them: they can get away with things that would seem tacky for other retailers. I wonder what other brands would get away with (GBK’s vegetarian ads were risky), and I wonder what Poundland’s next move will be. One thing’s for sure – they know how to get publicity.